AZ Prestige Gymnastics & Cheer is located in North Glendale, one block south of Bell Road at the corner of 53rd Avenue and Phelps Road. 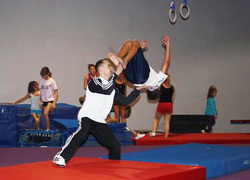 Our program offers gymnastics, cheer and tumbling classes for boys and girls of all skill levels and abilities, as well as adult classes housed in 15,000 square feet of fully equipped, air conditioned and clean training space! For those athletes seeking to commit to the team experience, we offer developmental through competition teams in Girls Gymnastics, Boys Gymnastics and AllStar Cheer. All team experiences are offered at all levels, ages 3 through 18. If your athlete wants to explore and develop their gymnastics, cheer or tumbling abilities, our training facility is the place to be! We look forward to seeing you soon! Please provide a brief comment regarding the area(s) of interest.